I’m not a pro, and while I love to experiment once in a while, I really wouldn’t consider myself a makeup geek or fanatic in any way. I’m terrible at application and I’ve had the same basic routine for about 2 years with just a few tweeks here and there depending on my changing moods. 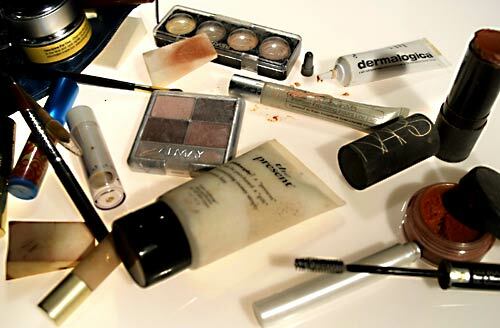 So I really don’t have a lot of makeup, but being femme I still have enough to get REALLY messy really fast. I’m thinking most of you fit into this same category. So when I got a little too frustrated by the little hurricane covering my dresser, I started looking up videos on how to organize it all. I should have expected that virtually all of these videos were geared towards makeup artists and fanatics, people with multiple huge eyeshadow palettes (DVD stackers are perfect for that!) and tackle boxes full of lipsticks. Clearly, I have no need for this stuff. I won’t be running off to Walmart to buy a 3 foot high plastic set of drawers. But it did give me some ideas, which I would like to pass on to you. Since my makeup collection is a whole lot smaller, I just made the storage smaller. I got some glasses out of the kitchen (hey, no spending!) of the size I felt was appropriate. They should be clear so you can see what’s inside them. In one of them I put all the tall skinny things, like mascara, lip gloss, and eyeliner. I may actually need to get a bit of a bigger glass for those. In another I put the flat things like eye shadows and small blushes. In a third I put bobby pins and little hair clips. You can also use a glass or pencil holder for your brushes if you don’t already use one. The bigger things, like foundation and powder stayed separate and on its own. There’s not much of it at all so it doesn’t matter. Of all the things I organized in this way, they were all things that I use not necessarily every day, but on at least a weekly or so basis. All the rest was put in a little velvet bag and stuffed into the back of a drawer. 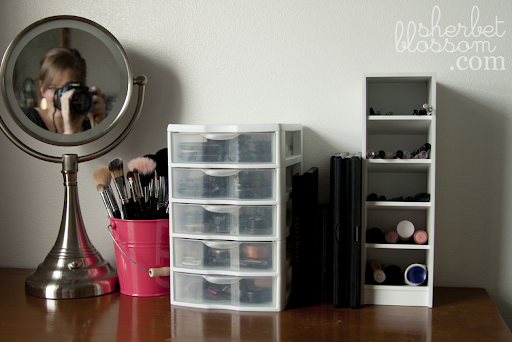 You can use a makeup case like you probably already do because, duh. Don’t forget to go through this every once in a while for things that may be overdue for the trash, or ready to be included in your routine. Sometimes the best thing to do before makeup shopping in a store is shop in your own collection. It’s easy to forget all the stuff you have. The only things I haven’t included by now are the items I carry around with me which stay in my bag, which is stick foundation, eyeliner, and a lipstick. It was kind of amazing how quick and easy it was. I’m almost feeling stupid now, but hey, what are you gonna do? I’m also thinking that it would be really cool if you could get your hands on some pretty little apothecary jars for this, and you could even put interesting if irrelevant labels on them, just because. And if they have lids, all the better if you need to travel. So that should pretty much do you. If you have more things, use bigger containers, up to and including the aforementioned 3 foot high drawers. If you have less, your dresser is probably a lot cleaner than the rest of ours. I admire that.